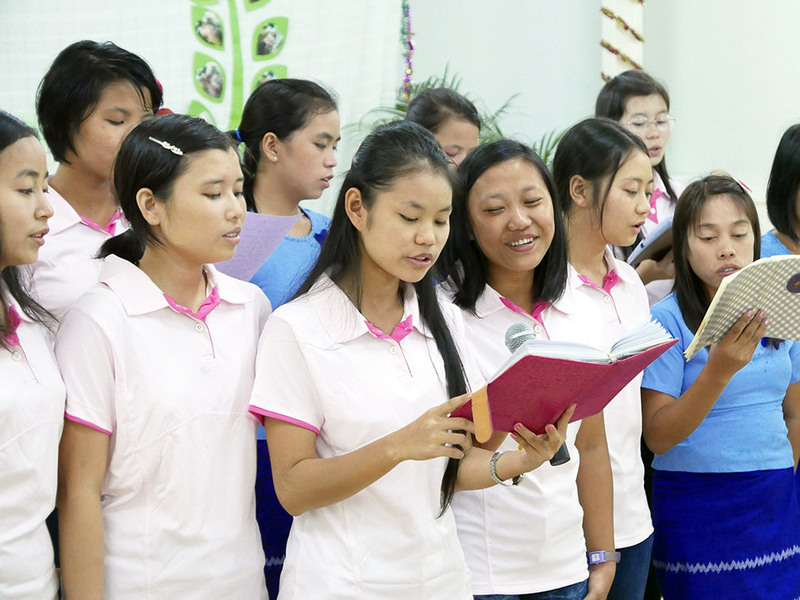 In 2006 we started together with the Good Shepherd Sisters, Yangon a 12-month vocational training program for high school graduates and university students from poor families and remote villages. The program addresses the lack of vocational training opportunities for youth and in particular for girls in Myanmar. In addition, the program aims to create self-confidence and develop leadership skills. The program is managed by the Good Shepherd Sisters and PIN funds most of its expenses. The training comprises theoretical and practical training of professional skills, English language and computer classes and leadership formation. The girls with different ethnic and religious background come from villages all over Myanmar. In Yangon the girls lived together in an own house in the Convent’s compound which we rented from the Sisters. The girls are responsible for all aspects of their daily life, including shopping, cooking, and cleaning. During the day they attend their theoretical and practical training at private education centers in Yangon. In the evenings and on weekends the Sisters provide additional courses on HIV/AIDS, human trafficking, nutrition, and leadership skills. During their free time on weekends and during holidays the girls participate in exposure and outreach programs of the Sisters to help the poor, sick and marginalized people in Yangon hospitals and townships. After graduation from the one-year program the girls return to their home villages and towns and engage in social work for NGOs or for the community’s ministries for at least one year. In 2006 we had started with 10 girls between 18 and 27 years old. We increased the number of students gradually to 20 girls per class. During the first 10 years the students received training in different subjects: Sewing, nursery teacher, nurse aid and pharmacology, computer and accounting and boarding house management. All students attended English and Computer classes. After 10 years we stopped our program in Yangon to move to Mandalay to the new Empowerment Center for Young Women which is also managed by the Good Shepherd Sisters. The “Rose Virginie Women Empowerment Center” in Mandalay Myothit is dedicated to the training of vocational and leadership skills. In May 2011 we invited all girls of the prior 5 classes for an Alumni Meeting to Yangon. 49 girls of our then 73 students attended the 3-day meeting. We got many suggestions and recommendations but critical comments too. In the 10 Yangon classes the Sisters had trained and educated a total of 162 girls. We witnessed the positive effects when the young educated and trained women returned to their respective home areas. They can manage their own livelihood with dignity and respect and support their family and the community. All graduates doing well, some of our graduates continue to work successfully in the social shop Hla Day.